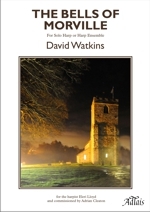 ..:: David Watkins : Score : The Bells of Morville ::.. When I lived near Oswestry, I often passed through Morville on my way to London. On one occasion, I surreptitiously ventured through the gate pillars and under the lime avenue to glimpse the beautiful juxtaposition of the Hall to its two pavilions and the mediaeval church. It was only later that a dear friend gave me the “Morville Hours” by Katherine Swift and, after meeting her, my fascination with Morville grew. She inspired me, not only with her insights into gardening and its history, but with her perceptive understanding of the Shropshire landscape and the origins of Morville with its Benedictine monastery. I gave a harp recital in the extraordinary acoustics of the mediaeval church, and became aware of the magnificent set of bells in the tower. The Tower Captain, Ian Rowe, introduced me to the bells during a weekly bell ringing practice, and after a short spell in the bell chamber I returned home so excited that I could hardly sleep. 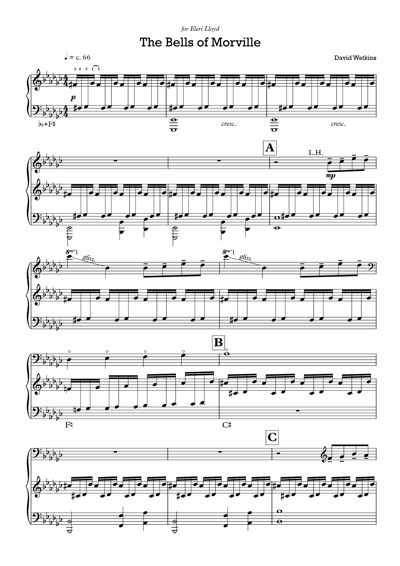 It was then that a work for the harp (or harps) juxtaposed with the bells of Morville started to emerge. and all other good harp stores.